Bob Jacklin knows about the salmonfly hatch on the Madison, he's been fishing it for 37 years. Don't miss this chance to find out how and when to fish this exciting hatch. Join us on Bob's informative interview. Bob holds a Masters Certification as a fly casting instructor, and sits on the FFF's Board of Governors for fly casting instructions. He has been tying flies commercially since 1963 and is a past recipient of the FFF's Buz Buszek award for his contributions to the art of fly tying. There are few people in the country with as much in-depth knowledge of fly fishing, fly casting, and fly tying as Bob Jacklin. He is a charter member of the Federation of Fly Fishers, on the pro-staff for St, Croix Rods, Ross Reels, and Cortland Lines. On October 23, 2004, at the Catskill Fly Fishing Center and Museum, Bob Jacklin was inducted into the very prestigious "Fly Fishing Hall of Fame." 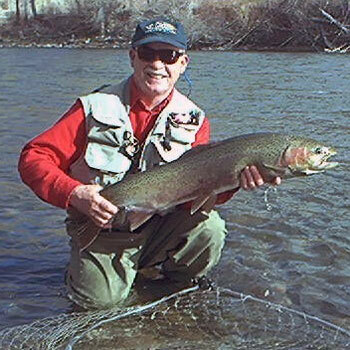 For more information on Bob's fly shop, gear and guided trips in Montana and Wyoming visit his web site at www.jacklinsflyshop.com. Click Here to order Bob's book.